Dollops of Diane: Latest Mommy Bear Media Review and a Giveaway! With the busy summer months in full effect, we haven’t had time for a “real” movie night here at the Dollops’ household. 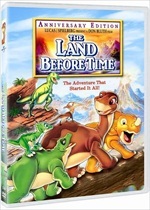 Instead, we chose to watch our latest family friendly flick, The Land Before Time, over a few nights before bed time. Once you get past the harshness of poor Littlefoot’s mother who is taken out by a T-Rex (think Bambi or Lion King) and the whole earthquake/drought thing, the film is adorable. I mean after all what great hit doesn’t have a few hurdles for the star to overcome? The kids weren’t fazed at all by the storyline anyway and totally enjoyed it. In the end it’s a great tale of friendship, teamwork, courage, and tenacity. Plus, hello…it’s got DINOSAURS in it. That’s an immediate win in our house! Now if watching dinosaurs fight to the death isn’t your cup of tea, how about watching kids do it? Sorry, that’s the best transition I could come up with to talk about Hunger Games! 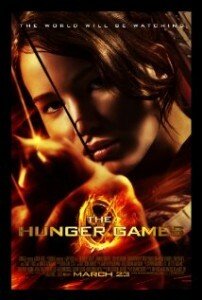 Did you know it’s being released on DVD/Blue Ray on August 18th? In celebration, Mommy Bear Media is giving away a copy to a lucky winner. Wouldn’t it be great if it was you? Head on over to Mommy Bear and follow the instructions to enter. Contest ends 8/18/12. Good luck! While you're there make sure to browse through their DVDs, they've got some great ones and they ship for free!